Penn State Mont Alto Campus Theme | Penn State Mont Alto is a learning community that brings people together for shared learning experiences, discovery, and knowledge.To deepen our students’ understanding and retention of information while also cultivating problem-solving and critical thinking skills, Mont Alto chooses a campus-wide theme that allows the entire community to work together in shared learning experiences. Penn State Mont Alto is a learning community that brings people together for shared learning experiences, discovery, and knowledge.To deepen our students’ understanding and retention of information while also cultivating problem-solving and critical thinking skills, Mont Alto chooses a campus-wide theme that allows the entire community to work together in shared learning experiences. Penn State Mont Alto The Penn State Mont Alto men’s soccer team held an Antietam Humane Society (AHS) Benefit Game on Saturday, September 13. The purpose of the event was to raise support for the prevention of cruelty to animals and the promotion of humane treatment to all animals. We wore specially designed AHS jerseys, collected $37 of cash donations, as well as collected numerous dog/cat supplies (Purina Kitten Chow, Non-scoopable litter, and dog food) and collected house supplies such as bleach, laundry detergent, stamps, pens, and sticky notes. All of the proceeds were donated to the Waynesboro, Pa. Antietam Humane Society during the Week of Sept. 18. On Saturday, September 23 the Mont Alto women’s volleyball program held a Salute to the Military match. Our focus was to honor all branches of the military prior to the match with a 15-minute pregame ceremony that included the presentation of the colors by the United States Marine Corps (Carlisle, Pa. Recruiting Branch), a live rendition of the national anthem by U.S. Navy and Mont Alto Instructor in Music and Arts Fred Davison, and the volleyball team designated Walter Harbaugh as an honorary captain. Harbaugh is a Franklin County native who turns 101-years old in December of this year and is a veteran of the United States Army where he was stationed in Germany during World War II and fought in the Battle of the Bulge.Director of Athletics Staci Brennan, Mont Alto student-veteran Chris Seery of the U.S. Air Force, and head coach Randy Hood presented Walter with a Mont Alto game day jersey as part of the pregame festivities. We had over 250 people attend the match including many veterans from the Franklin County area. On Saturday, October 14 the Mont Alto men’s soccer team will be holding a Pink-Out Game in support of Breast Cancer Awareness. We will be wearing specially designed pink jerseys, breast cancer survivors/all cancer survivors in attendance will be honored at halftime, a donation table (manned by the Mont Alto women’s basketball team) will be on site, and at the conclusion of the game there is a silent auction table with items from local business. In my heart, I had to do something to help those who were affected by the destructive path of Hurricane Harvey. I knew others wanted to donate items to individuals who needed help, so that is when I decided to spread the word to the Penn State Mont Alto community about the donation site in Chambersburg, PA. Staff and faculty started to drop off items at my office – these items included: baby diapers, reading books, water, lotion, toothpaste, shampoo, etc. This was about communities coming together to help those in need and that is what we did. We are…one community helping another community in a time of need. On April 5, 7PM the Penn State Mont Alto Library will show the first of monthly films about Iran, around, or in Iran, or made by Iranians. The initiative is entitled Docunight and is meant to encourage cultural exchange and understanding of Iran through documentaries. The films will be shown the first Wednesday of every month in 2017. It is Co-sponsored by the Iranian Student Association and Penn State University Libraries. Docunight events are free of charge and open to the public. For more information about the events at Penn State Mont Alto, contact Lisa White, head librarian, at 717-749-6044 or acw3@psu.edu. April 19, 7:00 to 8:00 p.m., Wiestling Student Center, “Alphabet soup-Social Consequences of Gender Identity,” by Shaashawn “The Voyce” Dial-Snowden. To celebrate “Pride Week,” Dial-Snowden will speak on the topics of diversity, multiculturalism, and inclusion. She is founder of Voycetress Media, LLC, Dial-Snowden and “strives to exercise her own voice to inspire those who may have lost their voice to rediscover it and to aid those who do not think they have a voice―to find it,” according to her website at shaashawn.com. This event is open to the public and free of charge. “Everybody can be great…because anybody can serve.” – Dr. Martin Luther King, Jr. Together with 14 people total, 11 students and 3 staff, we took a van on Monday, January 16 to the New Hope Shelter and Thrift Store in Waynesboro, PA to assist their staff with cleaning, sorting, organizing, and rearranging the donations that come to the thrift stores. In the morning students had the opportunity to discuss Dr. Martin Luther King, Jr.’s life and legacy of service. The thrift stores fund 2, and soon to be 3 shelters in the local communities helping many men, women and children. We wanted to make the Martin Luther King, Jr. Day of Service a Day ON, not a day off. The Diversity Committee promotes, supports, conceptualizes, and participates in events related to diversity at Penn State Mont Alto and in the local community. During the spring 2017, the Diversity Committee will host four events to create an awareness that people are different from ourselves and that we must understand and appreciate such differences. The events are designed to bring diversity and culture to our doorstep and offer our campus community an opportunity to participate in the same, thereby, also supporting Penn State Mont Alto’s campus theme: Reflect, Act, and Engage. January 25, 12:00 to 1:00 p.m., The Millstream Café ― Grab some lunch and enjoy the music! Reggie Wayne Morris is famous for his unique interpretation of traditional blues. His upbeat, up-tempo, rockin’-style blues pays homage to the moods and grooves of yesterday, but his signature sound and contemporary lyrics have caught the attention of today’s most prestigious music publishers, record companies, and concert promoters. This “Unity in Diversity” event is sponsored by the Diversity Committee and paid for by Student Activities Fees. February 21, 5:00 to 6:00 p.m., General Studies Auditorium ― Celebrate Black History Month with this dance company Baltimore-based West African dance and drum ensemble. Artistic Director Nai Zou Olivier was born in Africa, where he danced with the National Ballet of Ivory Coast until 1991. He released a critically acclaimed African dance video in 1998 and travelled internationally to promote it. As the artistic director of Nazu Dance Company, Olivier uses traditional and contemporary forms of West African dance and drum as a vehicle for cultural expression and a medium for personal healing. Members of Nazu and Company represent a cross-section of dancers and drummers who join in an effort to share the cultural richness of West Africa and the Ivory Coast. This “Unity in Diversity” event is sponsored by the Diversity Committee and Student Activities Fees. March 22, 12:00 to 1:10 p.m., The Mill ― Irish blessing is one of the most requested Irish music and dance ensembles on the contemporary world music scene today. Deidre has danced with The chieftains at the Kennedy Center in Washington, D.C., and the Myerhoff symphony Hall in Baltimore, MD, and is a rising fiddle phenomenon, famous for her signature-style melodic phrases, heavily influenced by the “old school” players from Ireland. Every day is St. Patrick’s Day when Irish Blessing takes the stage. You can also make an Irish bracelet and learn about Irish jewelry and Celtic knot patterns. 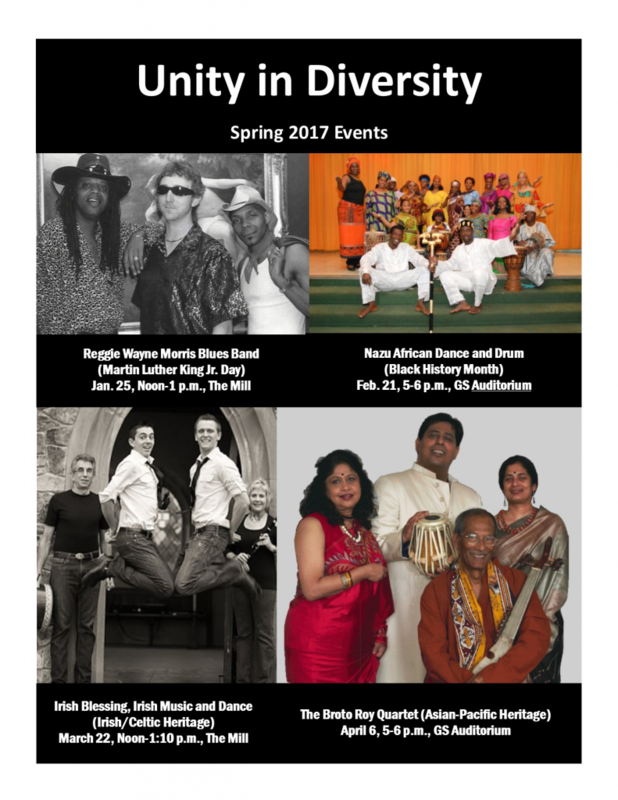 This “Unity in Diversity” event is sponsored by the Diversity Committee and paid for by Student Activities Fees. April 6, 5:00 to 6:00 p.m., General Studies Auditorium ― Broto Roy was born in India where his great-grandfather Rajanikanto was one of India’s greatest songwriters. Roy began studying traditional Indian music at the age of 6 and in 1998 he released his debut album, “American Raga,” which has the unique distinction of being played aboard the international Space Station. Mixing traditional Indian rhythms and Indian singing, with elements of modern jazz and rock, Roy’s Quartet played to sold-out crowds and rave reviews. This “Unity in Diversity” event is sponsored by the Diversity Committee and paid for by Student Activities Fees. Penn State Mont Alto students and community members picked 2,205 pounds of apples in Knouse Orchards on Mentzer Gap Road in Waynesboro, PA. The apples were donated to the Waynesboro Homeless Shelter. “It truly was both a fun and meaningful experience for an awesome organization and cause, The Gleaning Project of South Central Pennsylvania,” according to Donna Rhodes, coordinator of student activities and program development. Beginning December of 2016, PSU MA will be activating their campus theme sites page. This resource will act as a repository for faculty, staff and students to share their campus theme activities, reflections and comments. We encourage you to post your campus theme activities; be they large events or small acts, be they in the classroom, on the campus or out in the community. The campus theme committee will be updating the ‘Upcoming Events’ page, so you can plan for, and participate in, upcoming activities. However, we request your contributions to that list. Please email any upcoming activities you would like us to post at djd139@psu.edu with your ‘upcoming events’ and we will post them accordingly. PSU Mont Alto Theme 2016 – 2018. The current campus theme comprises three interrelated core principles, “Reflect, Engage, Act.” This year, both individuals and groups are applying these principles purposefully and intentionally to work toward personal growth as well as the betterment of our University, the communities we serve, and the world. Our stories and experiences can be found here at this site. We invite you to add your own. These actions represent Penn State’s core ethical aspirations for what we do every day as students, faculty, staff and volunteers. •	We value every member of our campus community and the respectful treatment of others. •	We commit to honesty and integrity and to assuming personal responsibility in our relationships with others. •	We believe in excellence, providing education that is rigorous, well-rounded, and relevant, and helping to prepare productive members of the community. •	We contribute to local and global efforts to make our world a more sustainable place for future generations. •	We value discovery and the creation and dissemination of new knowledge.